Your favorite characters from Five Nights at Freddy's are now awesome articulated action figures! 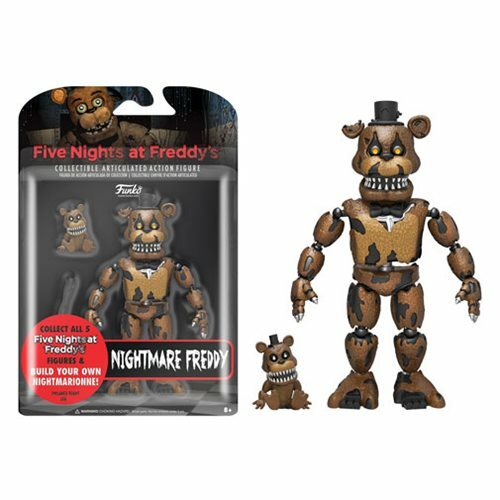 This Five Nights at Freddy's Nightmare Freddy 5-Inch Action Figure features the main mascot, Freddy Fazbear in his terrifying "Nightmare" deco! Freddy Fazbear features articulation at the head, waist, elbows and knees. This action figure includes a build-a-figure piece to build your own Nightmarionne action figure! Nightmare Freddy comes packaged in blister-card packaging. Ages 8 and up.